I've been bursting to share my exciting news here on my blog, today's the day I can finally post it. I've joined the Kitchen Sink Stamps Design Team! I'm thrilled to be working with their beautiful images, and talented Design Team! On Monday's, here on my blog, I'll be posting KSS creations along with the other members of the Kitchen Sink Crew. Today, I'm combining my KSS Monday with this weeks CPS Sketch. I used the sketch as the inspiration for my card - changing my finished size to 5-1/4" x 5-1/4". 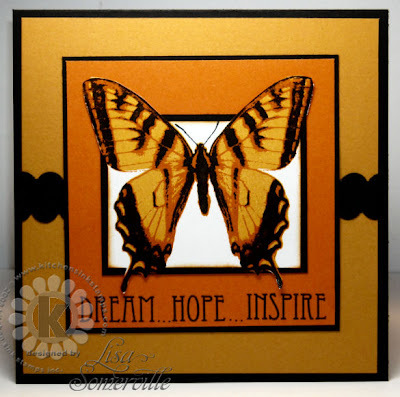 Using my Rock-a-Blocks, I stamped the large butterfly from the 3 Step Butterfly Set in Mustard, Pumpkin Pie and Black inks, on White card stock. I used my paper cutter for the Out of the Box Technique, sponging my edges in Pumpkin. I lined up the Vintage Words (Dream/Hope/Inspire) on my Rock-a-Block and stamped in Black on Pumpkin card stock. Adding the dots with my Black marker. To create the ric-rack, I used Stampin' Up! 's Scallop Edge Punch. Be sure to visit the other members of the KSS Crew, they have some wonderful projects to share this week too! Congrats to you Lisa! Way to go....it's a win win combination. Fabulous colors on this gorgeous butterfly, Lisa!! What a stunning creation for your Kitchen Sink debut!! Your card design is sensational!! How lucky we are to have you bring your awesome vision and talent to the Kitchen Sink Crew!! I look forward to working with you in the upcoming months!! Welcome to the CREW! We are so excited to have you joining us in the Sink. What a gorgeous creation! I love the bold striking colors. Beautiful! Congratulations on your newest appointment. What a gorgeous creation to start out your journey with. Beautiful colors for the butterly and nice layout. This is soooo beautiful, Lisa! I just love the colors you used for this stunning butterfly! Congratulations hun!!! I love this Beautiful card, and the color combo!!!! Great job!!! Congratulations, Lisa! You'll be an excellent team member for this company. You do such a beautiful job with the stamps. Congrats on your new DT assignment! Your card is gorgeous! Congratulations on your KSS status. What a beautiful card to start with. I love the bold colors, and the stamping is flawless. Congrats to you :) I love that gorgeous butterfly your card is absolutely stunning! Congratulations, Lisa! KSS is lucky to have you designing for them. And I agree, that Butterfly looks very real! Wahoo and congratulations on the DT nod! You are so talented and certainly deserve it! Gorgeous card for CPS! Way to go! WooooooooooooHoooooooooooooo! Congrats Lisa!!!! Good for you! and for KSS to get you on board! Now, onto the card: OH. MY. GOSH!! THis is STUNNING! breathtaking! And this card is BEAUTIFUL!!!! Congratulations Lisa! Your work is so beautiful and this card is no exception! TFS! What a beautiful butterfly image! Great job with CPS 113! Wow! Love the colors and the butterfly image. Way to go on the CPS sketch. YEA FOR YOU! Somehow I missed this post. This is so exciting! Your recent KSS cards show they chose the right person for their dt!! Oh....love this card too!